Antacids have been formulated to provide instant relief. Natural antacids are also used by several people to cure acid reflux which involves the use of herbs. Then there are the over the counter antacid drugs which are very popular. These are usually liquid or chewable medicines which neutralize the acids in your stomach. Antacids have proven to be the fastest acting remedies for acid reflux but are also the most temporary ones. One of the most common ingredients used in antacids is calcium carbonate which not only tastes like chalk but is actually chalk, at least in terms of fundamental composition. However, recently, ingredients like aluminium hydroxide have also become common alternatives in antacids which have proved to be better than calcium carbonate. These drugs would taste better although not upsetting your stomach very much and are just similar to the calcium carbonate antacids, if not better. Just like antacids you can also find these easily at any drugstore. The acid reducers however take a longer time to start working but once they start working you can surely expect a great relief from heartburn for several hours. The Pepcid AC and Zantac are the most common acid reducers which include drugs like famotidine and ranitidine respectively. They are also sold out in generic forms in cheap prices and work just as fine as you would expect. It is important that you use them temporarily and not for a long term. The Proton Pump Inhibitors, also called as PPIs, fall into the third group. Most of these drugs are available through prescription but the oldest PPI is sold under the brand name of Prilosec which is easily available at any counter. These PPIs might take nearly two days for their maximum effect but if you take them regularly then that could be an extremely effective remedy of acid reflux, albeit one with side-effects. Apart from this you can also take them safely along with acid reducers for improved result. This again means that they are not recommended for frequent use and you should minimize their usage. One of the most popular PPI drugs that are approved by the FDA is Aciphex (rabeprazole sodium). Nexium (esomeprazole magnesium) is yet another acid inhibitor that is approved by the FDA. Before using any of these drugs, it is important that you consult your physician to avoid any negative side effects. Please note that all of the drugs discussed above only provide temporary relief and none of these drugs actually help you cure the main factors that contribute to the whole problem of acid reflux. Till date, the most effective way to deal with acid reflux has been embodied by the HOLISTIC TREATMENT which dives into the inner imbalances that trigger this painful condition and is also perfectly natural without any side effects. 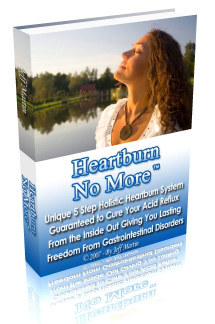 It is the ideal remedy to attain an acid-reflux-free life forever.